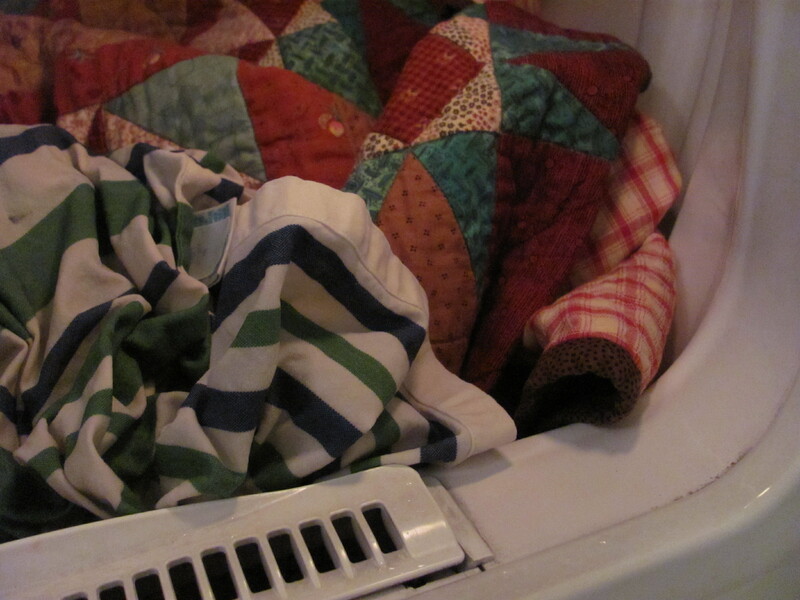 A little time with a damp cloth in a dryer on low heat will freshen a quilt. Photo by Barb Gorges. Quilt care directions seem to be synonymous with quilt washing instructions for many people. But when does a quilt need washing? When it has actual dirt on it, actual body oils. Quilts can often smell musty after being in storage, but that doesn’t mean they need washing. Each washing shortens the lifespan of a quilt (however, grit can cause fabric wear). Sometimes, all a quilt needs is a good airing. If it has been folded up, lay it out on a bed. Maybe open a window to get some cross ventilation. If it is too smelly for indoor airing, go outside. Find a shady place to lay a sheet on the lawn, with the quilt on top, and another sheet over it—to protect it from the birds. This is supposing you have a nice lawn and the wind isn’t blowing. Resist the temptation to put your quilt on the clothesline—it’s hard on the stitching, although today’s densely machine-quilted quilts are probably up to the task. I have multiple parallel clotheslines I can lay a quilt over—but I need to clean the plastic-coated lines first. Using a protective sheet on top is a good idea. But company is coming and you don’t have time to lay the extra quilts outside for the day. So try this if the quilt is colorfast: Wet two or three colorfast hand towels and throw them and the quilt in the dryer on a low heat setting, or even just on air. If the quilt gets too damp, remove the towels. If you are fond of the smell of dryer sheets, add one, or sachets. Moist, low heat in the dryer also helps take out fold marks and removes pet hair, allowing you to put off washing for a little longer.